Discussion in 'General' started by yardmaster, Nov 15, 2017. After wanting one for a while I finally decided to get a bachmann 2-8-0 and reletter it. 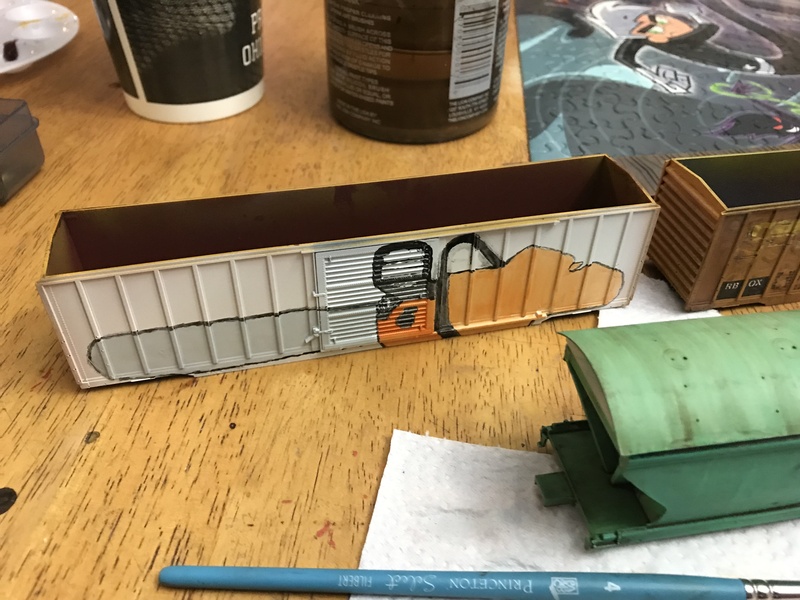 The best deal I could find was on a western Maryland unit, so it needed a little bit of work before it was ready for decals. I finally got the decals put on this morning and I'm pretty happy with the results. Still need to get a tsunami decoder and speaker to install before I put the tender shell back on. Did you have to remove the fireball? What did you use? What kind of work did you have to do? I picked up a Bachmann 2-8-0 that is lettered for Baldwin loco works so I need to remove lettering on the tender. I use Solvaset soaked paper towels Gary. It works well on factory lettering. Just soak a little piece and place it over the part you want removed. After a few minutes use a qtip to wipe off. It should not effect the base paint color. Sirfoldalot, Joe Lovett, rjthomas909 and 2 others like this. Gary, that’s more like it from your mad scientist lab. 5 random acts of modeling. HA! I have dropped one model and seen a couple others of mine hit the floor. That is a horrible feeling. Glad you could help him out. Years ago I was moving and my parents helped. My mom loaded up some boxes like it was old work shirts that didn’t fit. 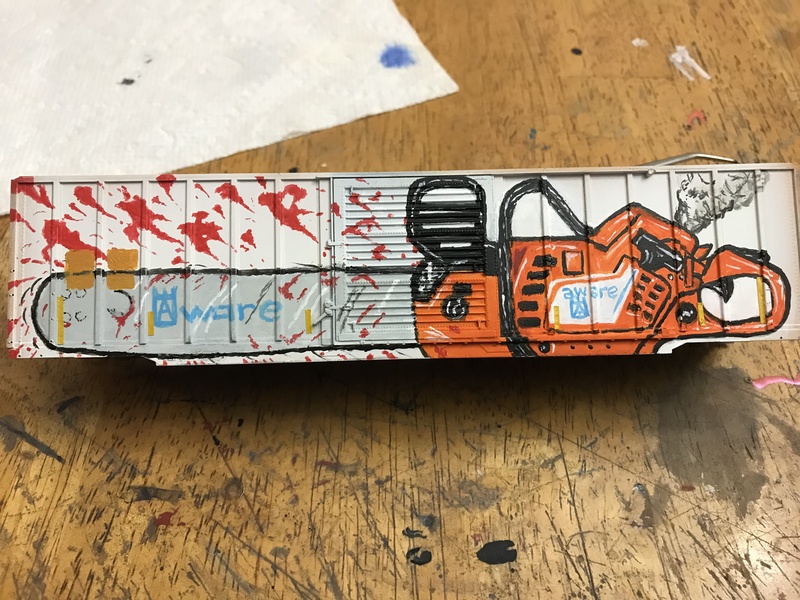 Turned out to be two 1/25th scale scratchbuilt trucks. Oh well right? I have been on the plus side though having repaired a few brass U25b models I have picked up cheap after people have sent them crashing, becoming decent additions to my collection. Looks like you're on your way to having a smooth running Pacific! Good job of helping your modeler friend. Sirfoldalot, rjthomas909 and Ozarktraveler like this. I have two Big Boys on the layout now, the old Rivarossi pizza cutter and now this Athearn Genesis one. It's amazing how it can make around my 25" curves, even with the tender as close coupled as it is. The overhang on both of them is ridiculous, though. The sound is incredible though LOUD so the first thing I did was turn it down. 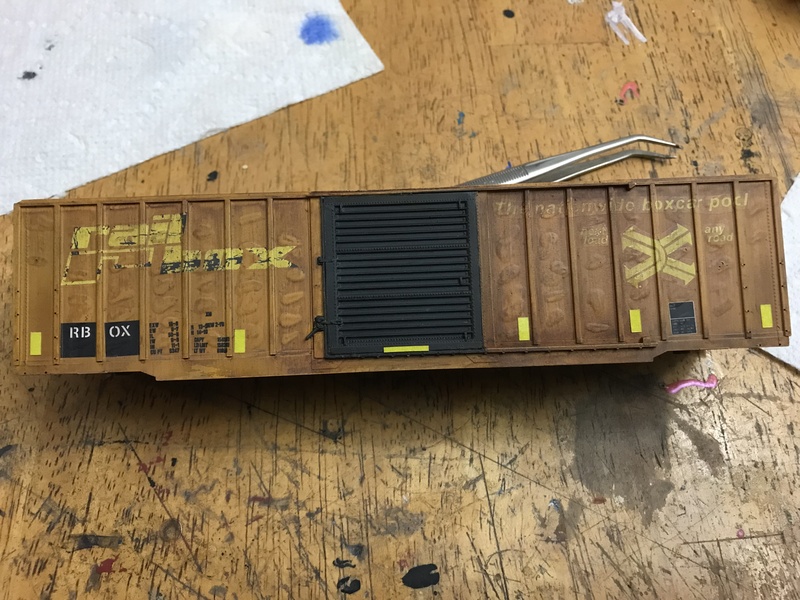 My friend is modeling the Soo Line in North Dakota, (pronounced "NorT DakOta") so a Big Boy doesn't fit his layout, either, but he has enough space to run it. Sirfoldalot, Ozarktraveler and Joe Lovett like this. The shell of the tender will come off. There is a single screw that holds it on. I tossed the whole thing in some rubbing alcohol and painted back with some flat black krylon. 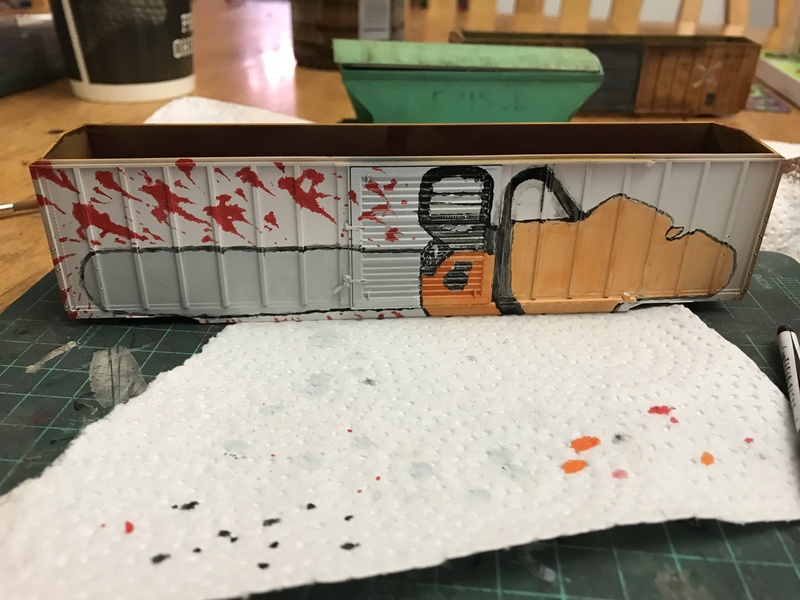 Mine also had a red roof that I masked around and painted flat black. I couldn't get the cab letting to budge so I just painted over it. The K4 decals will work good enough. 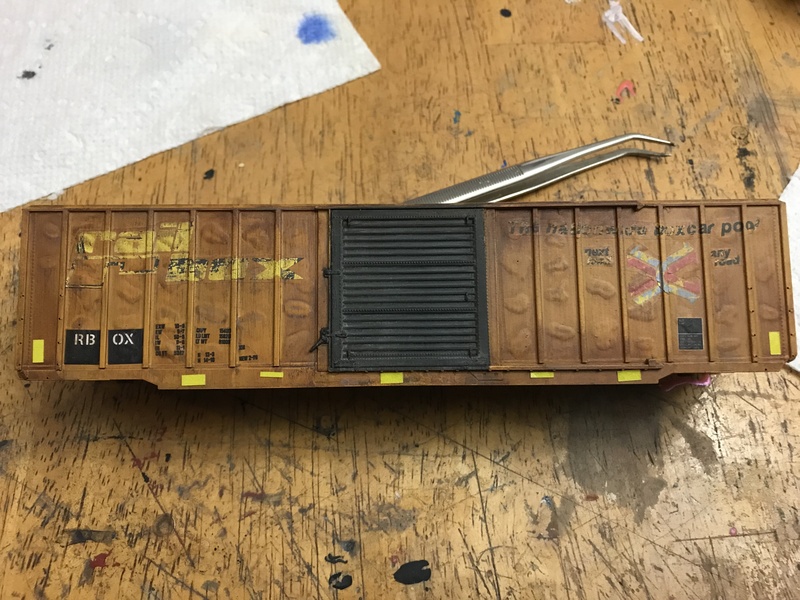 I use the second biggest Frisco lettering for the cab. The tender numbers are a little small but serviceable. Well, I think that I totally missed last Wednesday for some reason. Things here in San Antonio are starting to warm up, so more time for yard work and less for trains. However less does not mean zero! Managed a few hours here and there to work on wiring modules. The old mine module did not have wiring up to the standards of the new modules, so working on some re-wiring. Also, the small extension for a switching layout needed wiring, in particular switch machines. I also made it to the New Braunfels, TX train show this past weekend, and snagged a Digitrax Zephyr Express controller to use until my malfunctioning DCS 150 can be repaired. It includes USB interface, so going to give it a try with JMRI. I hoped to have the switching layout fully functional to show today, but did not quite meet that goal. A treasure no doubt! Looking to get some couplers on this guy and some weathering. I am sure it will appear frequently and prominently in future layout photos. Many thanks @gjslsffan ! Joe Lovett, Ozarktraveler, Sirfoldalot and 2 others like this. Besides getting close to done on my GMC Cannonball I had a couple kinda quickies I wanted to do for myself. I don't approve of graffiti by any means but I am amazed at some I see. This was a picture I stumbled on to and knew I needed to add to my shelf. I had a couple undecorated cars so I have worked on it the last couple nights.Lots of super thin layers of acrylics. Ozarktraveler, gna, Sirfoldalot and 3 others like this. Ozarktraveler, Sirfoldalot and rjthomas909 like this. 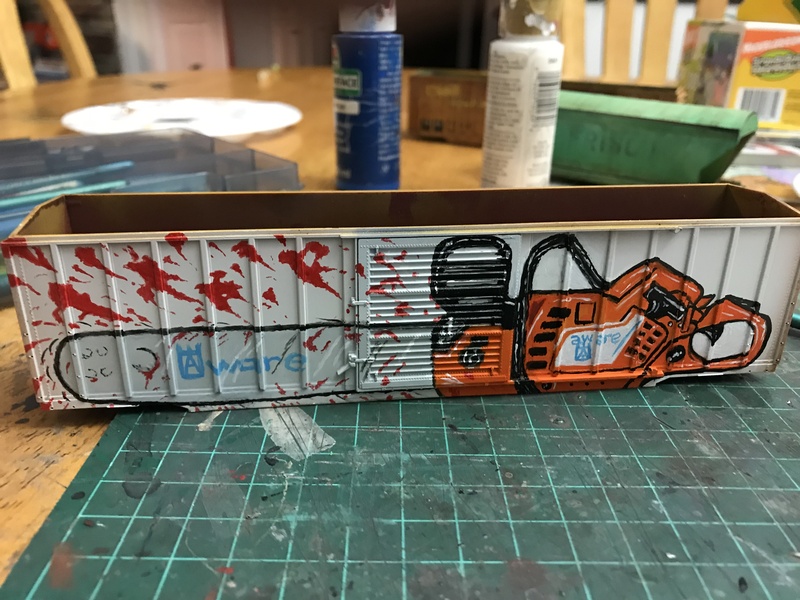 @modeltruckshop , that chain saw graffiti is awesome! Makes me consider switching modeling eras......maybe. Thanks Bob! Glad you enjoy it. HMmmmm 36' wood boxcars with fulltags perhaps? HA I have a couple terra bytes of tag pics when you are ready. Is that a salute to The Texas Chainsaw Massacre? Sirfoldalot, Ozarktraveler and modeltruckshop like this. One of the buildings was unpainted, but the wash killed the shine as well as filling in the mortar lines. Sirfoldalot, gjslsffan, w3hodoug and 4 others like this. I'm amazed at the cost of the paint and the effort that must go into painting (defacing?) 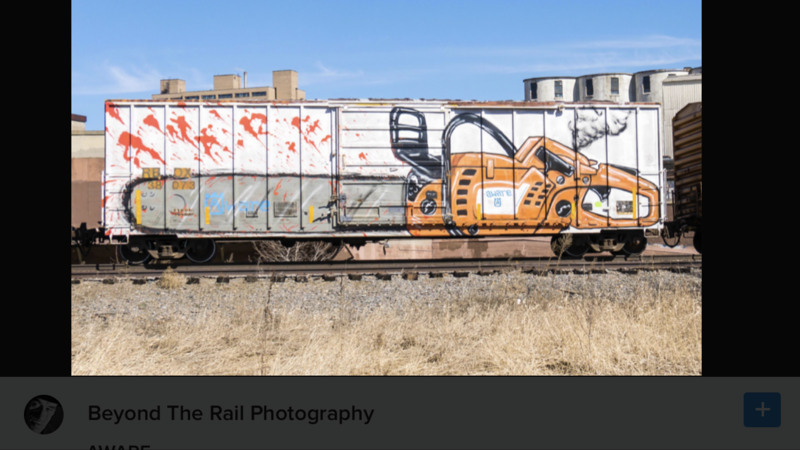 the entire side of a rail car. You would need a ladder and who-knows-how-many rattle cans of Krylon to finish the job of painting something you may never see ever again once the car is moved. Finally inventorying and photographing my HO models. pensive, rjthomas909, gjslsffan and 3 others like this. I also found an old Roundhouse kit I started bashing to be 1295 about 30 years ago. I'll probably not live long enough to finish it. The Spectrum I did as 1290 suffices. Sirfoldalot, rjthomas909, gjslsffan and 3 others like this. Great stuff Doug. I have always liked that 553 of yours...... And the others. Nice to see the regulars hard at work on their workbenches. I am really hoping to budget more time at my own, since any work has come to a complete standstill. Steve, I think you're onto something with the wavy panels. I'd say "good to excellent" on the first attempt; any first attempt by me for anything tends to look more like it was done by a kindergartner. Doug, thanks for sharing the inventory. A lot of these, I dare say, are models I saw in the old FMIG newsletters that Tim Cannon loaned to me that really cinched wanting to model the Frisco. Keep at it on 1295 if you want to. Two 1200-class Consolidations are better than one, I always say. 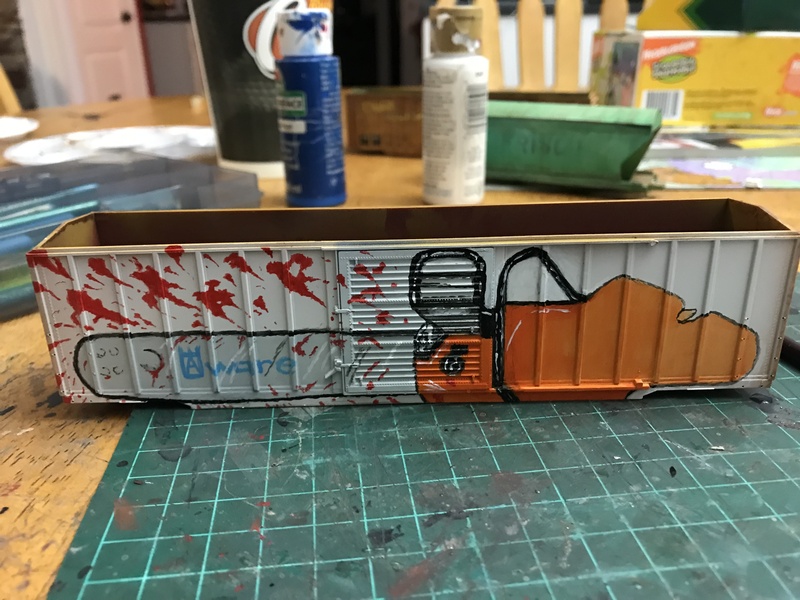 Joe Lovett and modeltruckshop like this.